God uses healthy congregations to build his kingdom in Illinois. But what makes a church healthy so that it grows by making disciples? Studies show these five commitments are the building blocks for kingdom growth. 73% of born again Christians say they have a personal responsibility to share their faith with others. 52% have actually done so in the past year, according to Barna research. If we believe hope in Jesus Christ is the greatest news a person could receive, why do 31% of adults never evangelize? For many people the answer is they don’t know how. And they lack confidence. When churches focus on intentionally training believers to effectively share their faith, members start to gain confidence in becoming active disciple-makers. Studies show that believers actively involved in a group actually pray, serve, give, and read their Bible more than those not plugged in to regular community. The Millennial generation, especially, places a high value on relationships­­­–most citing group activities as main reasons they stay connected to the church. When churches put an emphasis on the power of witnessing through prayer, the body experiences great growth individually as well as corporately. 4. Start with the kids! Vacation Bible School is the single most effective evangelistic tool churches have. LifeWay VBS specialist Jerry Wooley reports nearly 3 million people participated in Vacation Bible School in 2014, and 80,000 children made professions of faith. In addition, 1 million unchurched individuals were identified. 64% do so before their 18th birthday. So why not bring the biggest need (salvation) together with the best opportunity (VBS)? Last year, 432 IBSA churches didn’t hold a Vacation Bible School. For them, faithful old VBS is new territory! And for all churches, there are opportunities and resources to expand VBS to weekends and weeknights, Winter VBS, and joint VBS with other churches in parks, backyards, and apartment complexes. The call to reach the whole world with the gospel starts right here, right in the community around your church. That’s your Jerusalem. Although there is no one-size-fits-all outreach event for every congregation, churches with successful community involvement do have one thing in common: they make outreach the priority. Host a bake sale, volunteer at a 5k, serve at a homeless shelter. Whatever outreach looks like for your community, do it! Be the hands and feet of Jesus. Does your church need to make a fresh commitment to any of these areas? 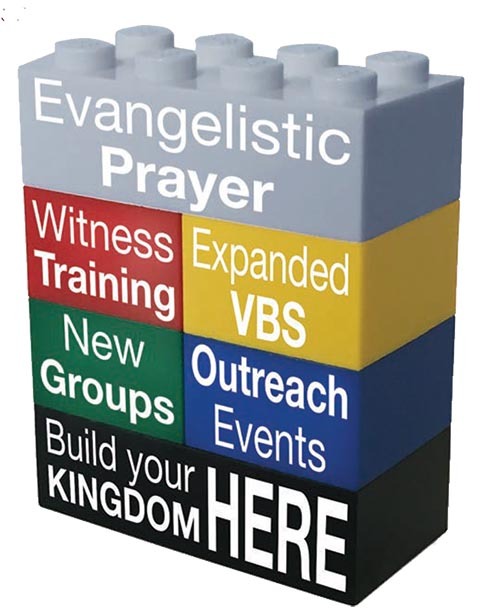 Prioritize these building blocks for your church and visit the Church Resources Team at the IBSA Annual Meeting. They’ll give you resources to take back to your church. Be sure to attend the evening session at 7 p.m. Wednesday evening, November 11 to learn more even more. Or contact the Church Resources Team for assistance with your fresh commitments to effective ministry. Each building block has potential in God’s hands to build up your church—and His Kingdom!